EASY AS PIE! PUMPKIN CHEESECAKE! 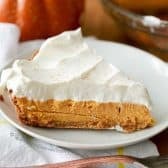 A rich and creamy baked pumpkin cheesecake with warm fall spices and a creamy whipped topping. If making homemade crust, mix butter, sugar and graham crumbs until well combined. Place in a 9″ pie pan and press along the sides and bottom. Place all ingredients in a blender and blend until smooth. Pour into prepared crust until about 1/4″ from the top. Bake for 45 minutes.Cool 4 hours in the fridge before serving. Top with whipped cream (or whipped topping) and a pinch of nutmeg before serving if desired.